Invite someone into the backwoods of Florida and they will inevitably ask, “Will there be alligators?” There is an alligator in just about every body of water in all 67 Florida counties, so the answer is always yes. However, unlike African and Australian crocodiles, US alligators are shy and skittish and disappear at the sound of people approaching. Alligators in Florida have killed only 17 people since 1948. Hikers are too big for an alligator to consider as prey but your pets on the other hand, are the perfect size. Do no take your dog on your thru-hike. We cannot emphasize this enough. Do not do it. 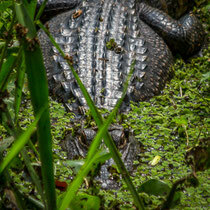 During the hiking season of November–March, cold temperatures leave alligators in a sluggish hibernation-like state. To our surprise, we saw very few gators on our thru-hike, possibly for this reason. When spring arrives and warm temperatures return, gators become active again. Males seek out females around May, and often leave one body of water for another in their search. This wandering brings them into contact with people more frequently, and one is more likely to end up in a suburban backyard during this time than any other month. During mating season, males bellow and you may be fortunate enough to hear it but will likely never see it. Their shyness keeps them from performing when people are watching. You cannot avoid setting up camp near water on the FT, so when you do, check the bank for large indentations clear of vegetation or a "slide" area that stretches from the water up and over the bank. These are spots where gators enter and exit the water. Make camp away from these spots. Do not go swimming at dusk or at night. That's when they feed. Never feed an alligator. Not only is it against the law in Florida, it is a death sentence for the gator. Feeding causes gators to loose their fear of humans. Fearless gators are considered a “nuisance" and are killed. Never approach an alligator. Observe and photograph them from a distance. They are capable of short bursts of speed and can raise themselves out of water several feet. To the surprise of many people from out-of-state, there are black bears in Florida. They have limited, isolated ranges depicted on the FWC map to the right. 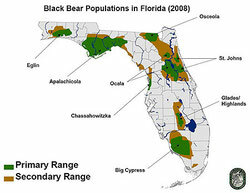 Thru-hikers are in bear country only while in the Big Cypress NP, Kissimmee River watershed, Ocala NF, Osceola NF, St. Marks NWR, Apalachicola NF, and Eglin AFB. Because Florida bears do not hibernate, they are active during hiking season. They are also much smaller than other North American bears, and look more like a huge black lab then their lumbering cousins elsewhere in the country. Recently, suburban development in the Orlando area has crept into bear territory. Poor garbage storage has led to confrontations between people and bears. While headline grabbing, these incidents are the fault of development & people, not inherent bear aggression. As far as we can determine from online records, bears living in wild lands have never attacked a hiker or camper. Wild bears are extremely shy and rarely seen. That said, you should take the usual precautions of hanging a bear bag. Best practices for bear bag hanging are described on the food gear & storage page. Six of Florida's many snake species are venomous: the water moccasin (aka cottonmouth), copperhead, eastern diamondback rattlesnake, timber rattler, pigmy rattler, and the coral snake. Thru-hikers should be able to recognize each species. Visit the venomous snakes page of the Florida Museum of Natural History’s website for complete information about identification of these species. Of venomous species, you will see water moccasins/cottonmouths more than any other, because they simply are not afraid of you. Unlike other snakes, even rattlers, who slip away and hide when they sense something big approaching, the moccasin stays put. On your thru-hike you may come across moccasins while they bask in the open sun of the Trail. When you do, let it be and walk around the snake, giving it a wide berth. Shouting at it does nothing since snakes don't have ears, and throwing things at it will not get it to move either. Do not try to prod it with your trekking pole, since the snakes can easily strike at that distance. Urban legends abound of moccasins "chasing" people, but they're not aggressive. They simply do not flee. One of the most common snakes in Florida is the banded water snake, which looks very similar to the moccasin but is non-venomous. Like the moccasin it is dark in color with a white chin, does not flee as you approach, and lives in the same environments as the moccasin: rivers, lakes, ponds, ditches, et cetera. While there are physical differences between the two species, their different behaviors are the easiest way to tell them apart. When disturbed or afraid, the classic cottonmouth threat display is to open its jaws wide to reveal its cotton-white mouth, hence the name. They may also twitch the tip of their tail like a rattler, but without sound. 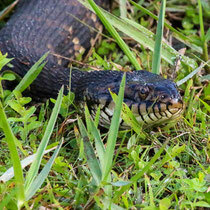 The banded water snake does neither of these things, even when provoked. The bottom line is that if you see a black/dark colored snake with a pale chin basking on the Trail, do not try to discern whether it is a moccasin or a banded water snake. Give the animal a wide berth and continue hiking. 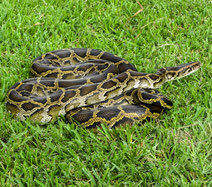 We have never seen a Burmese python on the Florida Trail, but it is one of the first questions people always ask. If a sighting were to happen, it would be along the first 100 miles in the Big Cypress Swamp. These non-native, invasive species are the descendants of either intentionally or accidentally released pets. While they do not pose a threat to hikers themselves, dogs are at risk. We strongly discourage thru-hikers from bringing their dogs for this and other reasons. The python's greatest threat is to the ecology of South Florida. If you do spot a python on the Trail, report it to the Florida Fish & Wildlife Conservation Commission's Exotic Species Hotline at 888-IVE-GOT1 (888- 483-4681). Leave a message if no one answers. There is also a free app for iPhone & Android for reporting invasive species. Search the app store for "ivegot1." The app is described on our electronics page under "Apps." A panther has never attacked a person in Florida. Enough said, right? Only tigers actively stalk, hunt, and eat human beings. The endangered panther on the other hand is incredibly shy and incredibly rare and so the only panther you are likely to see is at Billie's Swamp Safari. Pictured to the right, the former household pet lives caged next to a parking lot and is ironically named "Liberty." However, you are likely to find lots of evidence of panthers, as they live and roam all along the Trail. 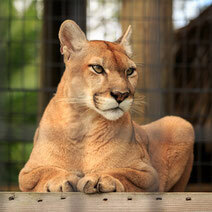 The panther has been squeezed into Florida's last remaining wild lands, and so has the Trail. Of all the National Scenic Trails, the Florida Trail is where you are most likely to come across a North American cougar. The big cats walk the Trail, stalking deer and other small animals that use the footpath as much as hikers. We found their footprints everywhere, along with smaller bobcat prints. If you are lucky, you might hear one in the night carefully walking through camp and find its fresh prints in the morning. When two males encounter one another, the territorial animals growl at one another in what we can only describe as an angry purr. Their sounds can be heard echoing through the forests. 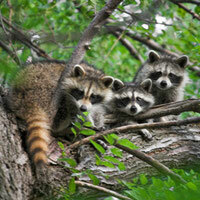 Your greatest animal antagonist on the Florida Trail is not the bear, but the raccoon. Raccoons are found everywhere along the trail, and like red squirrels on the Appalachian Trail or marmots on the PCT, raccoons are bold nighttime raiders. If a group has become accustomed to people they might approach your tent with you present during daylight hours. Any food left out overnight will be ransacked. Fortunately, raccoons don't seem willing to take flying leaps at bags hung from trees. Standard bear bagging procedure is enough to keep your food safe. The most dangerous animals you're likely to come across on the FT are not bears or panthers, but cows. 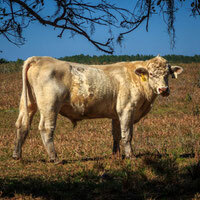 The FT often traverses ranch lands, and hiking season is also calving season. Female cows are giving birth, and their calves are vulnerable to predation from coyotes and panthers. At night on the trail we have heard coyotes hunting calves. Late into the night, coyotes yip and call to each other while cows bay and moan, trying to fight off the coyotes. When a calf is taken, the mother let's out what can only be described as a mournful cry. The cows are jumpy, in other words, and they are a skittish animal anyways. Females with calves will run away from you before you get too close, then stop, turn around and stare at you. Bulls do not run but freeze and stare. We have found that as long as we keep eye contact with a bull it will not move closer to us, but if we turn our backs it will. So if we turn a corner and find ourselves uncomfortably close to a bull, we maintain eye contact until we are far enough away that the bull loses interest and starts grazing again. As backpackers, we should be stewards of the environment and work with law enforcement to protect Florida's wild animals. To report orphaned, injured, or dead panthers, bobcats, bear, and other large animals, as well as hunting or fishing out of season, call 888-404-FWCC (3922).